US, 1990, 112 minutes, Colour. Mel Gibson, Robert Downey Jr, Nancy Travis, Lane Smith, David Marshall Grant. Air America is in the vein of M*A*S*H and Good Morning Vietnam, a look at a group of macho pilots in Laos, 1969, (who were not officially there) who ferry supplies and ammunition as well as opium for modern war lords (now allied generals) who sell to US servicemen and prophet by the war and American patronage. The tone of the film is both breezy and serious - in fact, strongly anti-war in its final gesture and its final sardonic after comments. 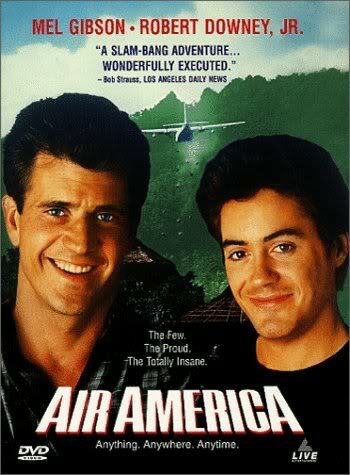 Mel Gibson and Robert Downey Jnr are effective as the pilots, working well together. There is a mixture of oddballs, manipulating top brass, an inquisitive senator and memories of the complexities of South East Asia. It is comic but serious. Direction by Roger Spottiswoode who has made a range of action thrillers including Under Fire, Shoot to Kill. 1. Serious comic look at the Vietnam war, a war film, macho action in the war context? 2. A piece of Americana? Thailand standing in for Laos? Panavision photography, the terrain, jungles and mountains? Vientiane and the cities? The country villages? Air sequences and action stunts and crashes? Editing and pace? Songs and musical score? The parody of 'the horse with no name'? 3. The title, the focus on air and pilots (and the tradition of American air films)? The role of Air America, its not existing, the orders it received, recruits, missions? The irony of the title? 4. The films case for and against the war in Vietnam? The words of president Nixon during the credits, the quoting of Nixon, the fact that Americans were not supposed to be in Laos? The major and Rob and their attitudes towards the waging of the war? The senator and his enquiry, the satirical touch in his portrayal, inquisitive and yet no fool? General Soong and the exploitation of drugs? Manipulation, cover-ups, the transport of arms, the money deals, investigations? 5. The M*A*S*H tone of the film? Types in action, in war? Macho attitudes, daredevils? Laughter and sentiment? Comedy and serious? The final captions and the ironic comments on the aftermath of the characters? 6. Air America's service - transporting food, live stock? Being shot at? The transport of opium - and the immorality of the drug trade? 7. The men as types, adventurers, their code, tensions and relaxation, beliefs, bombs, loyalties? 8. The contrast with the American authorities and their military background, covering up of truth, manipulation and reports, their personalities, exercise of power? The major and his threats, menace, behaviour, access to Washington? Rob as the second in charge, a yes man? His schemes for propaganda - tapes of noise, large condoms etc? 9. The role of the Senator: allegedly born again, given the visitors treatment, yet his threats and declaration that he was not stupid? Giving General Soong his bags, his apology? His morality? Looking at the rest and recreation? Looking at the action? His flights, discussions with Gene, the discussion with the girl in the village, his wanting to catch the drugs smugglers? His understanding of the operation - and the threats by the major? 10. Mel Gibson as Gene? type, in action, his repartee with Rob, the accidents and his reaction? Ability to fly, his relationship with his buddies, his wife and children in his home in the jungle? His collecting arms and selling them, his plans for retirement? The friendship with Billy, working with him? Recreating, letting off steam? Deals, rescues? Taking the Senator around? The rescue of Billy, the crash, jumping from the plane? Getting caught, doing arms deals and smooth talking? His reaction to the death of Neely? His knowing of Billy's action in blowing up the drug laboratory? Selling up everything to get the money? The mayday? Rescuing Billy, Billy's appeal to his conscience, rescuing the social worker and the children? Getting rid of the arms? His further plan for selling the plane? 11. The contrast with Robert Downey’s Billy: Los Angeles, commenting on the traffic, low flying, taking the helicopter to the truck driver? His being sacked? Sorry for himself, being recruited, flying into Laos? The introduction to the men, to Rob? Its effect on him? The oddball briefing? Going with Gene on his mission, the arms deal? Flying? His not being able to participate in the letting off of steam? On the outer? Meeting Rob and the social worker? His flying with Neely? The man overboard - and recovering? The being shot at, the elaborate sequence of the crash landing? General Soong recovering his drugs and not rescuing them? Gene coming to their rescue, the crash in the tree, jumping, being caught, the possibility of being killed? His being upset by General Soong? The decision to blow up the drug laboratory, the grenades? His being set up by the Major? The flight companion, their shrewdness, not landing, lack of petrol, the crash landing and hiding in the crash, rescue by Gene, the mayday, his helping throw the weapons away? 12. Various flyers: Neely and his eccentricity-,his kind of madness, on the flights, his blackout, jumping? The pathos of his death? Billy's companion on the final mission? The range of men, their attitudes, hard work, macho, codes - the moment of silence for Neely? Their participation in air America? 13. General Soong, the local warlord, his attitudes towards the Americans, manufacturing and transferring the opium, his snobbery, callous, his dream of owning a Holiday Inn? 14. Corrine and her social work., listening, the date with Rob, Billy's courtesy, at work in the village, telling the senator about the opium, the Mayday call and the final rescue? 15. The memories of the complexities of the war? American double talk? The effect on the people of Laos and Vietnam? A piece of conscience and Americana?